Although I painted this Lakers mural in Burlington, Ontario, I also sell cool basketball themed wallpaper murals that ship for FREE in Canada and the USA. They are really easy to hang and are removable when you’re ready for a new look. Are you thinking of a Lakers Mural for your kids room (or maybe a man cave)? Here’s a pic of a mural that I painted to help inspire you. Aaron is a huge basketball fan…he plays it, watches it and lives it and his fave team is the Los Angeles Lakers. 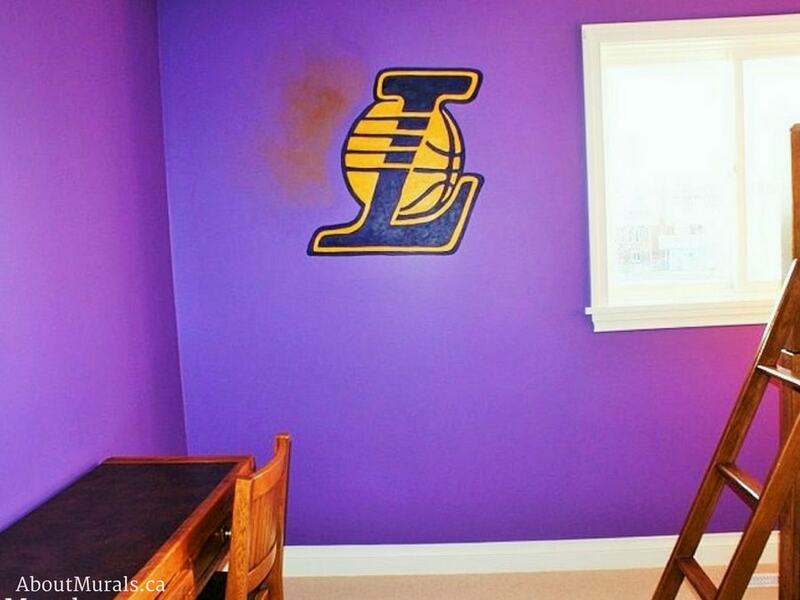 His parents painted the purple walls before I came to paint the mural for this sports fan, although latex painting is a service I offer before painting my wall murals, if you’re not the DIY type. I only use no-VOC latex paint and non-toxic acrylic paint for my murals, so your kids can breathe easy while they’re playing and sleeping. In this wall mural, I painted the LA Lakers logo that is on fire. If you’re thinking of a Lakers mural and you like my style, you can hire me! I’ve hand-painted murals, from Toronto to Niagara Falls, since 2005. I even got to paint one for a Mike Holmes show! Gimme a shout for your free consultation. My prices start at $350. Join my newsletter community and I’ll send you all the latest promotions and even some hot coupon codes!